This Exploration takes you through some of the most remote areas of this fascinating land; areas which have been rarely explored by others, making this a journey of discovery. The dunes of Sossusvlei are not to be missed and therefore we begin our journey here. This Exploration also takes in the amazing marine life just off Swakopmund, the secluded and dramatic coastline of the Skeleton Coast littered with historic remnants of shipwrecks and the rugged and rocky landscape of Palmwag where the last free-roaming black rhino rove. Aside from wildlife and activities, meet the native people of Namibia, from those who work at our camps to many others, such as local fishermen and vendors. On Day 1 you will be met by your Explorations guide and begin your journey by driving through the Khomas Hochland mountains and down into the dune-filled Sossusvlei region, a driving time of approximately five to six hours (330 kilometres / 205 miles). En route, we enjoy a lunch. 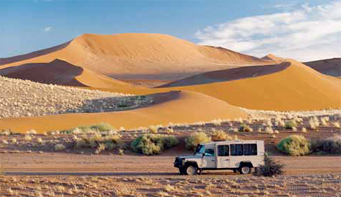 Explore the famous red dunes of Sossusvlei and our 37 000-hectare private reserve where you will discover life in one of the world’s oldest and most arid deserts. As the perfect gateway to the impressive sights of Sossusvlei, Kulala Desert Lodge is a favourite among Wilderness travellers. Magnificent views of dunes, mountains and vast open plains will be the setting of your stay. The camp comprises 23 en-suite thatched and canvas ‘kulalas’ each with a veranda for you to enjoy the outstanding scenery. On balmy nights, sleep under the clear night skies on your rooftop and awaken to the rising sun. By day, enjoy our activities or spot desert-adapted wildlife from our lounge and dining area overlooking a waterhole. To escape the midday heat a cooling plunge pool provides the ideal sanctuary. • Kulala Desert Lodge is in the private Kulala Wilderness Reserve, the result of a rehabilitation project by Wilderness Safaris that aimed to return this land, previously used for farming, to its former natural aspect. • Sossusvlei is situated within the Namib Desert, the oldest desert in the world, characterised by huge dunes and flat valley floors. • To showcase this vast and impressive landscape, we offer nature drives, walking, quad biking, horse riding and ballooning (last three at extra cost). • You can witness sparsely distributed desert-adapted wildlife such as ostrich, springbok, oryx, spotted and brown hyaena, and bat-eared fox. • One of the many fascinating bird species, the dune lark, has its entire global distribution limited to the area. Details: Kulala Desert Lodge - includes all meals, daily activities, laundry and drinks (excluding premium import brands). Our light aircraft transfer to Swakopmund Airport is in fact a spectacular scenic flight (weather permitting) that flies over the only well-preserved shipwreck in Namibia, endless dune fields and even an old diamond mining settlement. 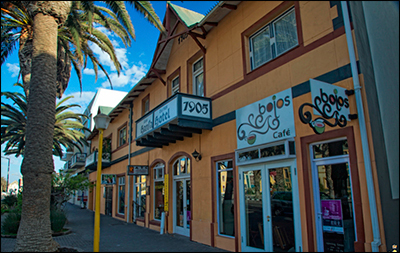 Discover the town of Swakopmund and bed down in the historic Hansa Hotel that forms part of city’s architectural culture. On Day 4, we explore the ice-blue Atlantic coast on a boat cruise (weather permitting) as well as the imposing Sandwich Harbour dune fields by 4x4. The adventure is rounded off with a private seafood lunch before driving back to Walvis Bay. The day starts at 09h00 with a marine cruise, exploring Walvis Bay Harbour, old boat wrecks, and the chance of spotting life such as pelicans, dolphins and seals, and even whales and turtles in season. At around 11h30, your skipper will drop you off on a deserted beach at the jetty of Pelican Point, where your Sandwich Harbour 4x4 guide will meet you with a Land Rover. You will be taken on an excursion to see the Kuiseb River Delta, the saltpans and the wetlands just north of the Sandwich Harbour Lagoon with the possibility of seeing their famed flamingos in one of southern Africa’s richest and unique wetlands. If vehicles cannot make it there due to tides, there is time to walk the four or five kilometres. Alternatively, you will get a chance to see the Lagoon area from one of the many beautiful lookout spots. En route, a light meal with snacks and salads, as well as oysters – some of the best in the world – and sparkling wine, are dished up. On the return drive, more giant dunes are crossed, including the big roaring dunes. You will arrive in Walvis Bay at approximately 16h30 after a fantastic day out. • Capture the breathtaking views of Walvis Bay from the ocean and look out for the Atlantic’s magnificent sea creatures. • Explore the awe-inspiring Sandwich Harbour area of the Namib-Naukluft Park in a 4x4. • Enjoy sumptuous oysters of the region while picnicking on a deserted beach or in the desert. We continue our journey by road for approximately 380 kilometres / 236 miles up the legendary Skeleton Coast (named for the numerous ships the treacherous shores have claimed over the years). You can expect to see the fascinating lichen plains at Wlotskasbaken, remains of the Zelia shipwreck near Henties Bay and the SW Seal shipwreck near Ugabmund. We also take in the ghostly remains of mining operations near Toscanini. Driving time is about five hours, excluding any stops. 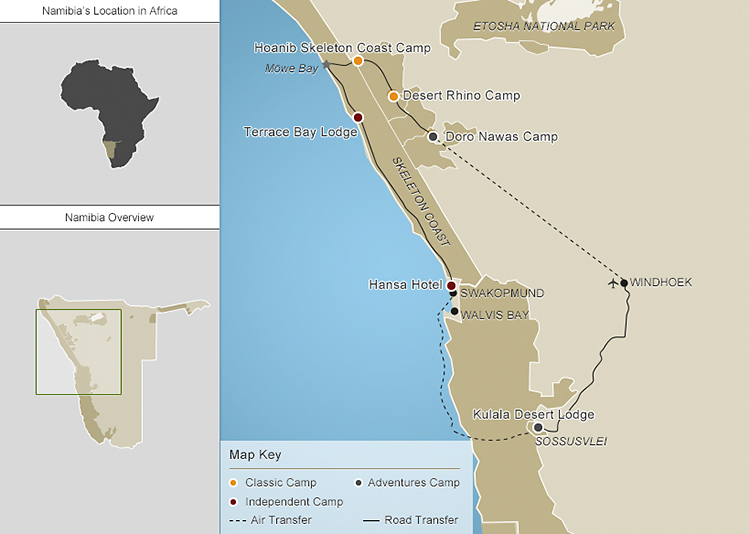 Terrace Bay Lodge is situated in the Skeleton Coast National Park in north-west Namibia. 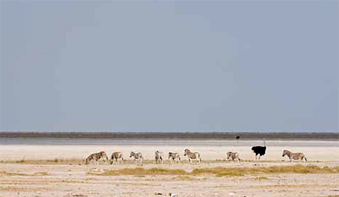 As the only accommodation in the Park itself, Terrace Bay is a popular destination in a remote location. This rustic rest camp has 20 comfortable en-suite rooms and a family chalet, while the bar and restaurant are convivial areas in which to meet fellow guests and discuss the exciting day’s happenings. This is also a destination for the angling crowd as the chances of catching a variety of fish here are amongst the best on Namibia’s coastline. Please note that whilst accommodation is clean, functional and comfortable, it is not a luxury lodge comparable to Wilderness Safaris camps. • Terrace Bay is a fantastic point from which to explore the Uniab River Delta. • Walking along the beach to view the dramatic coastline is very popular activity. Details: Terrace Bay Lodge - includes Dinner, bed and breakfast. We continue through Skeleton Coast National Park to the Möwe Bay Museum and then stop to admire the remains of the Suiderkus shipwreck. Other attractions are the Klein Oase and Auses Springs hidden in the dunes, an intriguing “roaring” dune and spectacular desert scenery combined with whatever desert-adapted wildlife presents itself. The distance to camp is only 140 kilometres / 86 miles, however, given the gravel roads the driving time is approximately 5 hours. A land of rugged scenery, this remote part of Namibia is inhabited by plant and animal life that has adapted superbly to the harsh environment of mountains, vast plains, dunes and dry riverbeds. Set in the starkly beautiful Palmwag Concession on the border of the legendary Skeleton Coast National Park, Hoanib Skeleton Coast Camp offers a unique experience of one of the most remote places on Earth. Eight stylish, well-insulated en-suite tents with shaded outdoor lounges are laid out against a rugged backdrop of hills and overlook a broad valley at the confluence of two tributaries, providing breathtaking vistas over the highly photogenic landscape. A small plunge pool awaits you after summer activities, while a winter lounge provides a cosy respite from the icy Atlantic fog when it settles over the coastal plain. 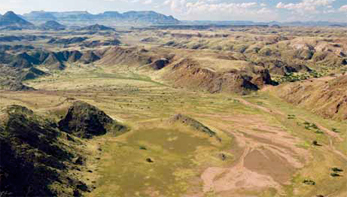 • Kaokoveld is a land of rugged scenery, a historic coastline, vast plains, and dry riverbeds inhabited by a surprising amount of life. • Activities on offer include game drives and nature walks. • Rewarding sightings of desert-adapted elephant, Hartmann’s mountain zebra, oryx, giraffe and springbok may be expected on game drives while coastal wildlife sightings might include the elusive brown hyaena and black-backed jackal. • Birdlife is equally exciting including endemics like bokmakierie. • The concession is a joint venture with the neighbouring Community-based Conservancies of Anabeb, Torra and Sesfontein. Details: Hoanib Skeleton Coast Camp - includes all meals, daily activities, laundry and drinks (excluding premium import brands). Another exciting day on the road to Desert Rhino Camp through the rugged, rocky and mountainous Palmwag Concession brings with it the opportunity of seeing giraffe, oryx and springbok. The speciality of the area is its stable population of the endangered desert-adapted black rhino (the largest concentration in the world outside a national park), which are monitored and protected by the Save the Rhino Trust. At Desert Rhino Camp, you can take part in a thrilling and exclusive conservation success story. Tracking Africa’s unique and endangered desert-adapted black rhino is an unforgettable experience. To set the scene, you will be shown into one of the eight en-suite Meru-style tents elevated off the ground. You can absorb the panoramic views over the rolling, rocky hills beyond from the privacy of your veranda. Full-day excursions are on offer; otherwise, between activities, relax in our tented living area. Evening meals are taken around the fire pit. As a wonderland of unusual plant life, fascinating wildlife and sparse wilderness, Desert Rhino Camp is begging to be explored. • We work closely with Save the Rhino Trust (SRT) which is almost singlehandedly responsible for the preservation of desert-adapted rhino in the area. A portion of guest revenue goes to SRT. • The impressive flat-topped Etendeka Mountains dominate the scenery. Dry river-courses like the Uniab River cut through the rocky landscape below, dotted with odd-shaped bottle tree, ancient leadwoods and unique welwitschias. • Tracking desert-adapted black rhino is the primary activity here, complemented by game drives, walks and relaxing in camp. • Other wildlife to be seen includes desert-adapted elephant, Hartmann’s mountain zebra, giraffe, gemsbok and kudu as well as cheetah, leopard and spotted hyaena. • Birdlife is varied with endemics such as bokmakierie and Ruppell’s korhaan. Details: Desert Rhino Camp - includes all meals, daily activities, laundry and drinks (excluding premium import brands). We bid farewell to our adventure as we transfer to the Doro Nawas Airstrip to return to Windhoek (cost of flight is included). Recommended Add-ons: At extra cost, continue onwards to Serra Cafema, a luxury desert retreat on the Kunene River, or to Ongava Game Reserve and explore Etosha National Park. Some of the areas in which we travel are private concessions, whilst at the lodges and hotels en route, as well as on Wilderness Air light aircraft transfers, we have the chance to meet other guests. The route we follow will be flexible, changing with the seasons to maximize each guest’s experience. Please ensure that you have the correct information. Wilderness Explorations also reserves the right to change itineraries due to unusual game concentrations or reason beyond our control. If there is a change to itinerary, this will be advised as timeously as is possible. To maximize guests’ travel time, a variety of travel modes are used to bring out the best in each area: flying in light aircraft and travelling overland by vehicle provide both a bird’s-eye view and an in-depth experience of the contrasting landscapes of Namibia. Please refer to the detailed itinerary for the specific camps used on this safari. We return to Windhoek at approximately 16:00 on the last day of the safari. Please ensure that your departure flight is booked for after 16h00 from Windhoek. For earlier international departure flights, an additional transfer will be required to arrive for this connection, subject to extra cost. • All personal purchases, including curios, drinks not specified above, telephone calls, compulsory comprehensive travel insurance, gratuities, etc.